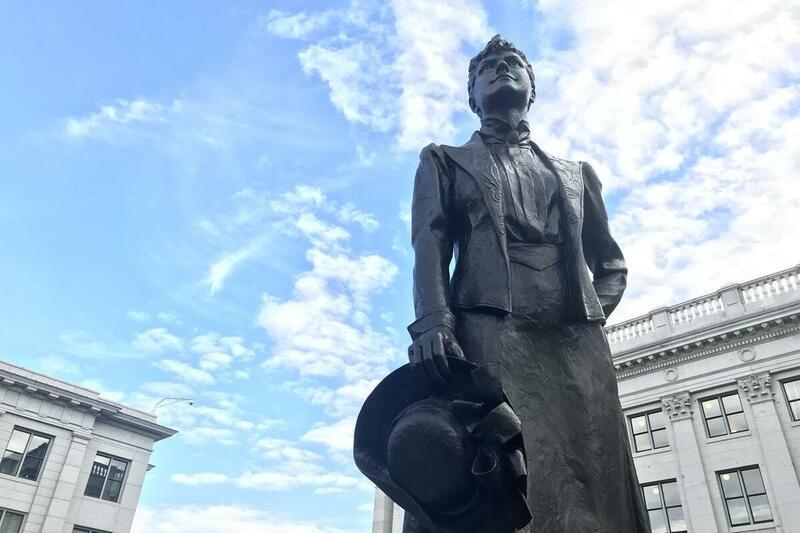 Utah Sending The Nation's First Female State Senator To D.C., As A Statue Utah plans to send a statue of suffragette and senator Martha Hughes Cannon to represent the state in the U.S. Capitol. It's a subtle approach to changing perceptions of women in Utah. A statue of Martha Hughes Cannon outside the Utah Capitol. Utah is sending a new representative to the U.S. Capitol, but it might not be what you think. The state legislature recently voted to send a statue of a nineteenth-century doctor named Martha Hughes Cannon to represent Utah in Statuary Hall. Each state only gets two statues, so Dr. Cannon will knock Philo Farnsworth, the inventor of the television, out of the circle. She'll join the Mormon leader Brigham Young. The statue is part of a modest plan to combat Utah's reputation as behind the curve for women's advancement. The plan is to trumpet the state's early history as a leader in women's rights. "We're putting our faith in the power of history to change perspective and identity," said Neylan McBaine, the CEO of Better Days 2020, a grassroots group that pushed hard for the legislature to send Martha to Washington. On a busy summer day in the U.S. Capitol, no one had heard of Martha Hughes Cannon. Even Utahans were puzzled by the news that Philo Farnsworth would get the boot. "I'm sure I've read her name, but I wouldn't be able to tell you what it was," said Lisa Cox, visiting from Logan, Utah. She was excited, though, that Martha Hughes Cannon's statue would soon represent Utah. "There's not a lot of women here," she noticed. Of the 100 statues in Statuary Hall, just nine are women. McBaine and the legislators in Utah who carried Martha's bill taught a little early Utah history to their colleagues in order to get the bill passed. "Martha Hughes Cannon as a young girl came across the plains with a group Mormon pioneers, and settled in Salt Lake City," said Becky Edwards, the Republican State Representative who carried the bill. She praised Martha Hughes Cannon as a public health advocate, and as a pioneer in running for the State Senate in the 1800s. "When she ran for political office when Utah first became a state, she ran both against her husband, Angus Cannon, and against her best friend. And she beat them both," Edwards said. Cannon was the first woman elected state senator in the country. She was also the fourth of polygamist Angus Cannon's six wives. She and many other women in Utah advocated around the country for universal women's suffrage, testifying before the U.S. Congress and representing Utah women in national suffrage associations. Utah first enfranchised women in 1870 — 50 years before the 19th Amendment gave all American women the right to vote. With the 100th anniversary of the ratification of the 19th Amendment approaching in 2020, Utah women will also celebrate the 150th anniversary of their first vote. "Now is the time to really highlight her as a legislator, as a physician, and her role in the suffrage movement," Edwards said. Edwards notes that she is part of the Martha Hughes Cannon Caucus, the small group of women in the Utah House and Senate. But somehow Utah has slipped from the leading edge of women's rights all the way to the back of the pack when it comes to measuring women's advancement. "Worst place for women in business, worst place for women in politics, worst place for women medically," said Neylan McBaine. Better Days 2020 is backed by some big Utah businesses that have trouble recruiting people from out of state. "These corporations are highly invested in changing the narrative about Utah women," she said. The results of their campaigns are already visible in Utah. Salt Lake City is renaming streets after suffragists. Utah has a new license plate that says "First to Vote." We should note that Wyoming women technically got the right to vote first, but Utah had an election first. McBaine's group is also writing a new curriculum for elementary and middle schools about Utah women's history. She hopes that the cumulative effects of these seemingly small gestures — like a statue of a Utah woman at the Capitol — will be transformative. "Utahans will have a different sense of their identity, their capacity, and their place in the world if they are thoroughly familiar with this history," she said.